Spooky Action at a Distance TV premiered Tuesday, September 20, 2016 on KPAO public access television in Omaha. Kyle Finley is your weekly host. Kyle invites local guests to engage in an enjoyable dialogue with the goal of connecting disparate ideas related to the paranormal, UFOlogy, religion, philosophy and science. Program announcements and personal dialogue with Kyle, some former guests and followers of the show can be experienced on the Spooky Action at a Distance TV page on Facebook. 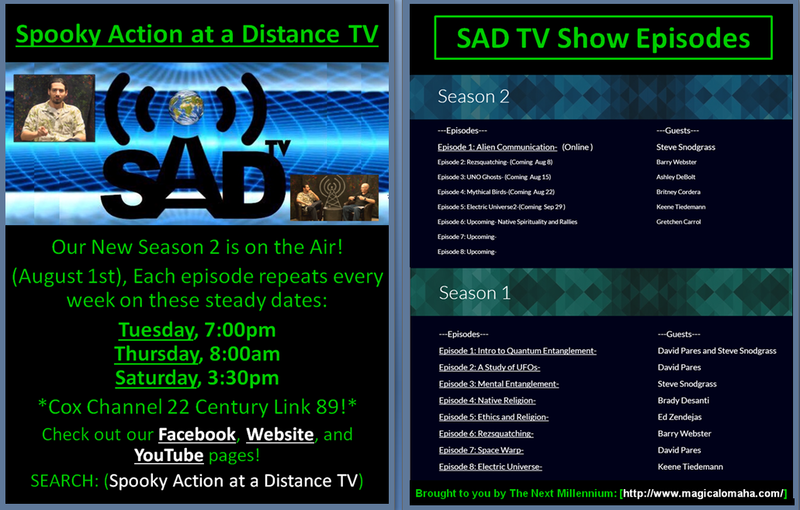 Full episodes are periodically updated on the Spooky Action at a Distance TV channel on YouTube. Copyright 2017 Omaha UFO Study Group. Copyright laws prohibit any copying, redistributing, retransmitting, or repurposing copyright protected material.